On our recent vacation Nags Head North Carolina we had a wonderful time gathering seashells on the shore . 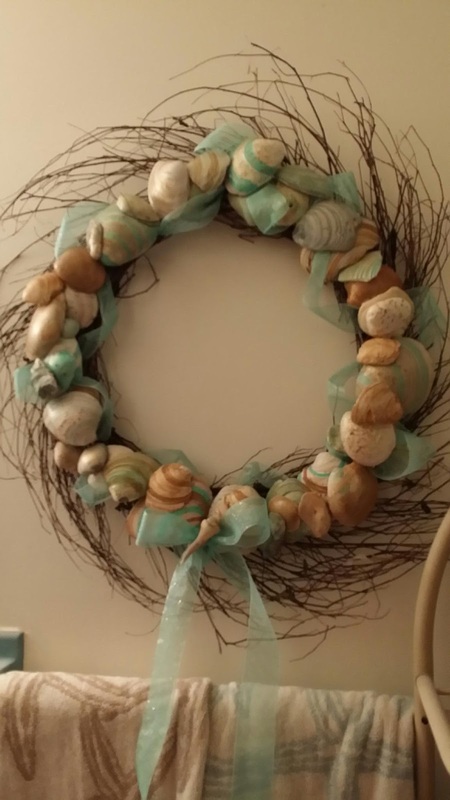 When we got back I went to Michael's and picked out a vine wreath. Choosing some paint colors that complimented my bathroom I exited the shells and then used some glitter paint to put a sheen on them. I arrange them the way I thought they look best and hot glued them in place. I've been added from sheer sparkly ribbon that I purchased at Michael's. 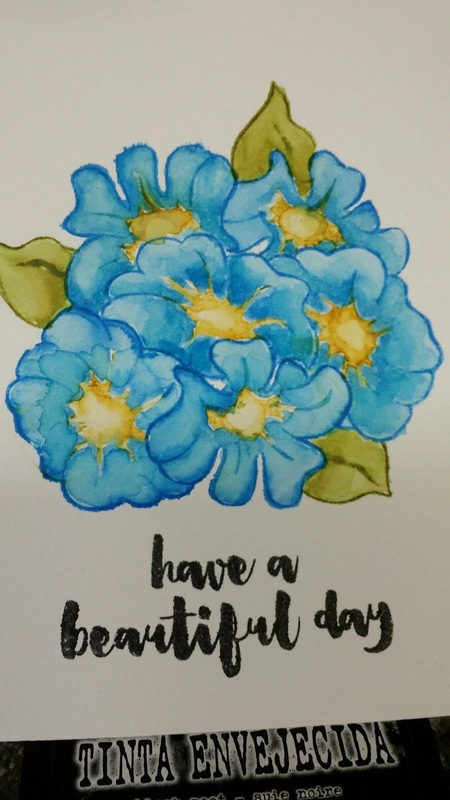 I really love the finished product and hope you do too, thanks for visiting come back soon. I love this sketch. 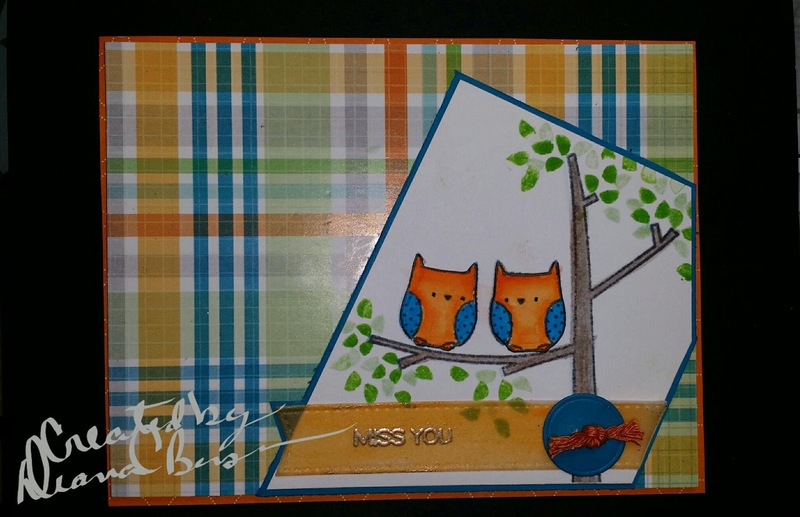 I started with the plaid paper it is from DCWV baby boy stack. I thought the colors were awsome. I stamped some images from mft things with wings on watercolor paper using MFT's lost lagoon, orange zest , and green room dye inks to watercolor my images. The orange base card stock is from Stampin Up. 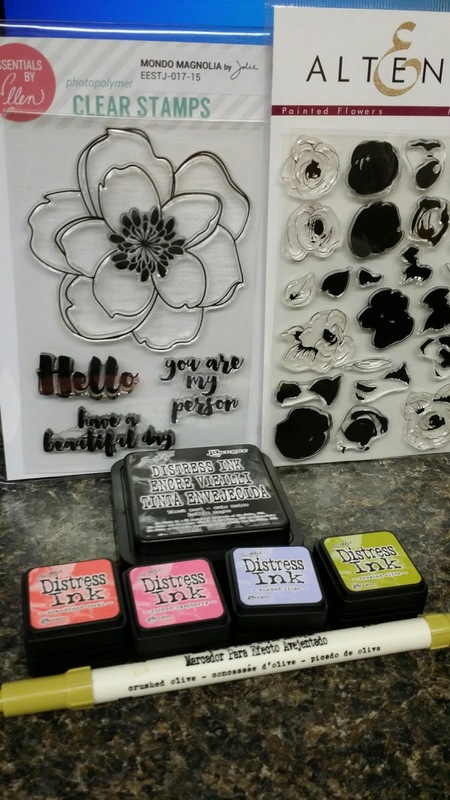 I used blueprints 20 to cut out a piece of vellum that I colored with Copics to make my fish tail banner which I embossed with Ranger liquid platinum embossing powder. The button die is from blueprints 14. I hope you like the way this turned out as much as I do. Thanks for stopping by. 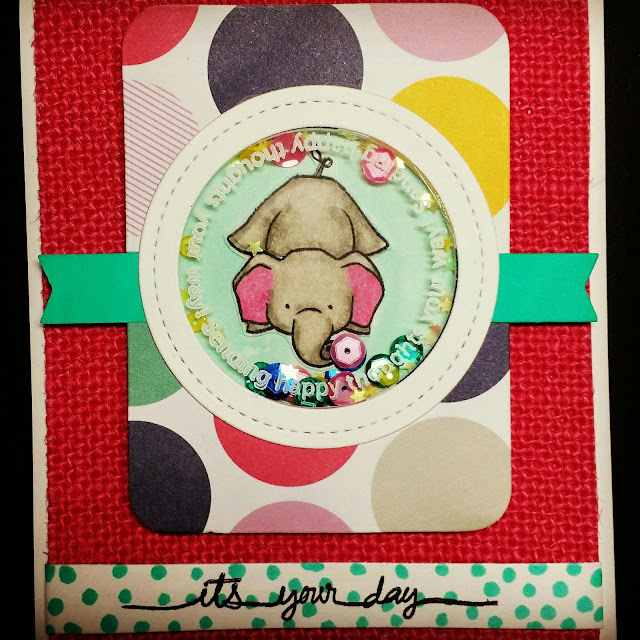 Looking at the sketch I saw the perfect opportunity to make a shaker card and use my circle sayings from SSS. The elephant is from Wplus9 Unforgettable. 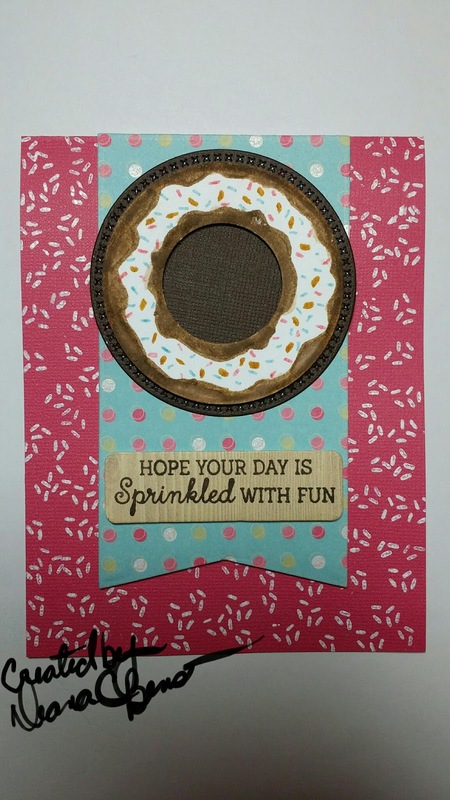 The polka dot cardstock was cut using MFT Blueprints 14 and the fishtail banner was cut using blueprints 16 then cut in half and placed on either side of the circle and cut with the circle to match. 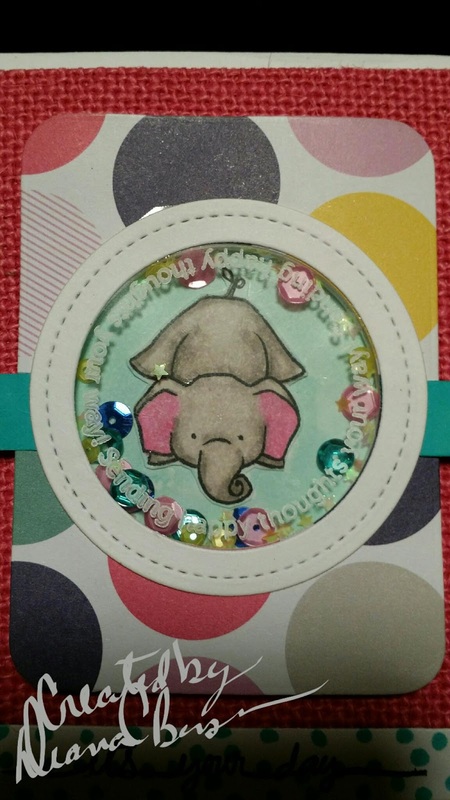 The frame for the shaker window was cut using the peek a boo Circle window die and a circle from Spellbinders. I use the same setup and cut two pieces of fun foam to create the frame for my shaker window. I use the circle from Spellbinders to cut a piece of acetate and then stamped it and white stays on with Simon Says Stamp circle sayings. my background piece was a piece of hot pink burlap cardstock. 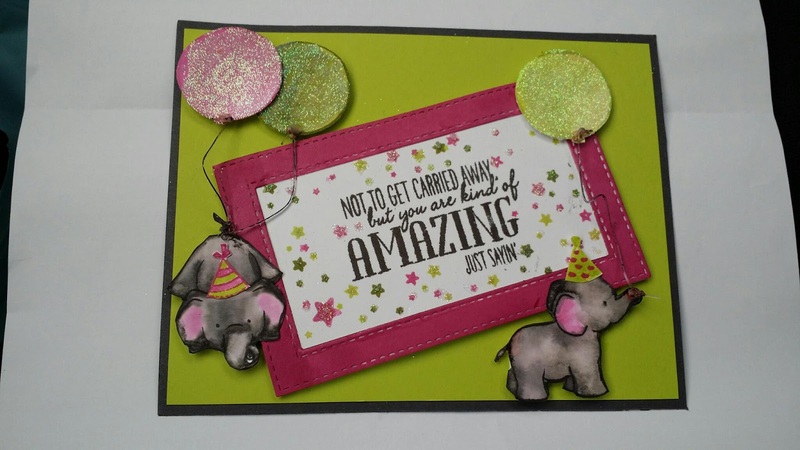 the sentiment is from wish big by Ellen Hutson. Thanks so much for stopping by. 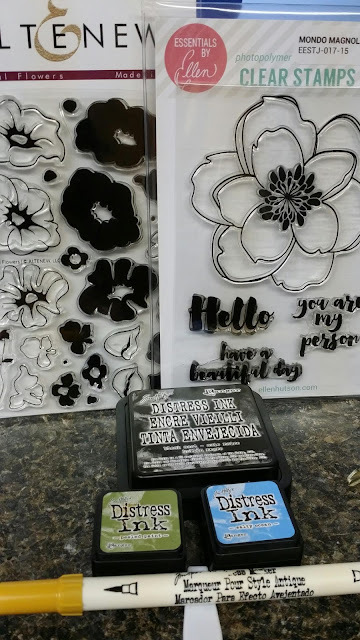 I finally received my SSS card kit and it is awsome. 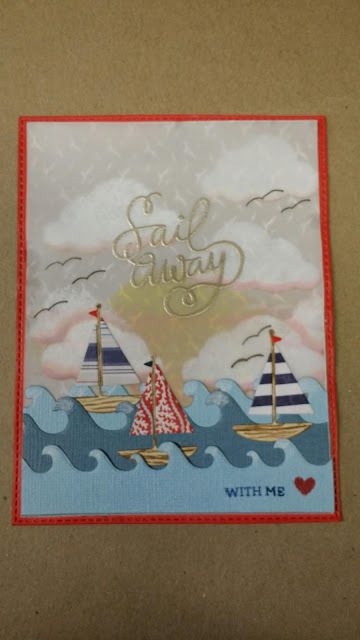 I used the little sail boat die and cut it out of several of the printed papers in the kit. I also had some wood grain printed paper I used to cut the hull and the staff. I use some of my le plume markers to color the little flags. I chose the piece of paper that was light grey with seagulls on it as a background piece . I had made a stencil to go with my cloud cover up by my favorite things by taking the plastic that is inside the pack of bacon and running the die through my big kick machine. First I made me a sunset and then I use this stencil and some white pigment ink and created my clouds. I did add a little bit of orange and pink to the bottom of the clouds to give it that reflection from the Sun. To make my waves I used MFT making waves die and cut two different shades of blue. I dabbed a little bit of white pigment ink on the tips of the waves just to give them that look that you see at the beach. I cut a piece of vellum to the size of my background and embossed in Ranger liquid platinum embossing powder my sentiment. You can't have an ocean scene without seagulls so I added them with a Multiliner black pen. I used my favorite things blueprint 25 and cut the red cardstock that came with the kit and mounted everything on it and then mounted it to a white card base. I really love how this turned out. Thanks for stopping by come back soon. Looking at this sketch the first thing that came to mind was a donut. So I pulled out my MFT Donuts and Sprinkles. First I created a donut with my SU 2 1/2" circle punch and 1 1/4" circle punch. 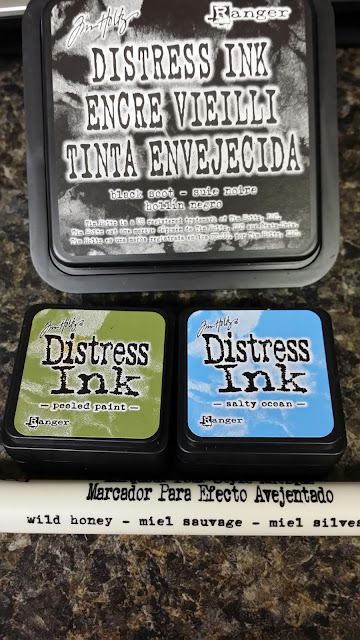 Using my distress markers I designed it. I used my cross stitch circle stax and cut a piece of brown card stock to go behind the donut. The label and fish tail tag were cut using blueprints 13. I stamped my sentiment in mft chocolate fudge ink. Fun foam was used to pop up the donut, fishtail tag and label. Starting with Strathmore 140lb cold press watercolor paper I started stamping my images from the Altenew set Whimsical Flowers I colored the center with a wild honey Tim Holtz Distress marker and dabbed salty ocean around the petals. I then stamped it in the center of the paper. As I worked I used my water brush to paint each flower and blend the colors sometimes touching my brush to the ink pad if I needed a little more color. I created a mask for each stamp used with masking paper. Using the mask I stamp the rest if the images painting them as I went. It is very important to let each area you work up against dry to keep the colors from mixing and bleeding. The leaves are stamped and painted in peeled paint. The Sentiment is from Essentials by Ellen Mondo Magnolia and stamped in Tom Holtz Black Soot. Thanks so much for stopping in. There are few times when you ,yourself look at your work and are completely satisfied. This is one of those times for me. I wasn't sure of my layout, which isn't unusual for me, so I just went with it. 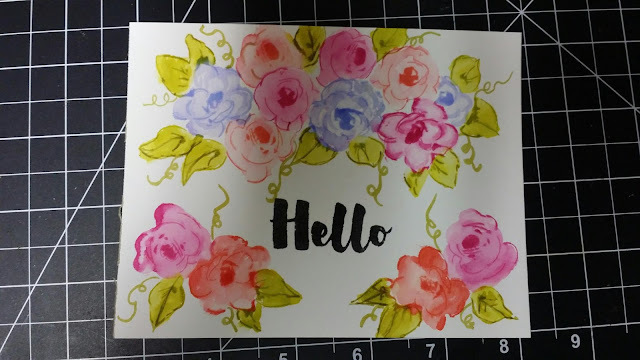 What I did know was I wanted to use my new Altenew Painted flowers set and Tim Holtz Distress Inks. I choose my flowers and created mask with masking paper. 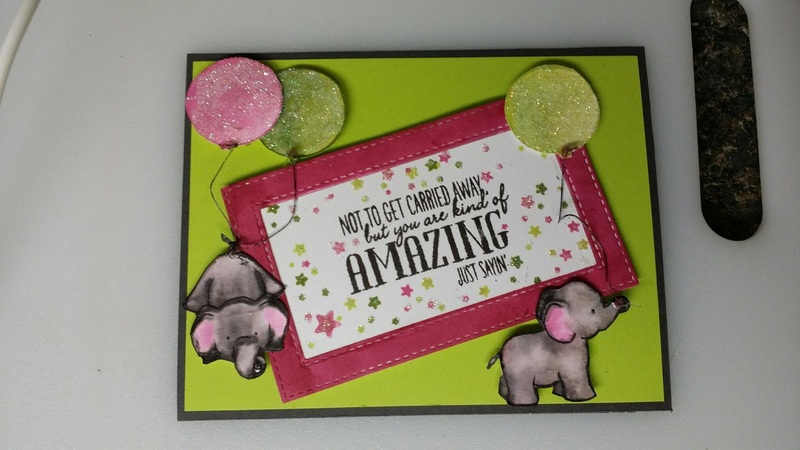 The inked I used were shaded lilac, crushed olive picked rasberry, abandoned coral and black soot for my sentiment. The first flower was the lilac one in the middle. I applied the lilac to the petals and crushed olive to the leaves. After stamping the image in the upper center I painted it with a water brush. 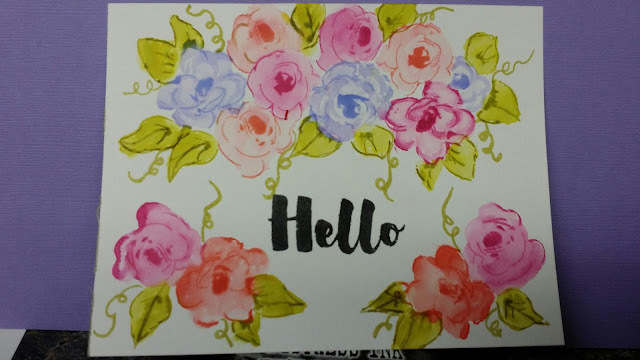 I did each flower the same way using the mask as needed. Some of the leaves I drew in along with all the curly qs with a crushed olive distress marker. My sentiment is stamped in black soot and is from Essentials by Ellen Mondo Magnolia. Thank you for stopping in, it's my pleasure to share.